Veteran wrestler from the days of the UWA. Was always considered one of the best lighter weight wrestlers in Mexico but made a name for himself in the Temerarios trio with Jose Luis Feliciano & Shu El Guerrero. Though ENESMA never worked out, Black Terry is still an active independent wrestler. He works mostly in the Mexico City area, and for IWRG and Lucha VIP along with other smaller groups. He's well respected for being one of the only veterans who can still hang with today's current generation of wrestlers and doesn't solely rely on working with his older buddies from the 80's. Black Terry is current the lead trainer for IWRG, responsible for the many new wrestlers who pass thru Arena Naucalpan. 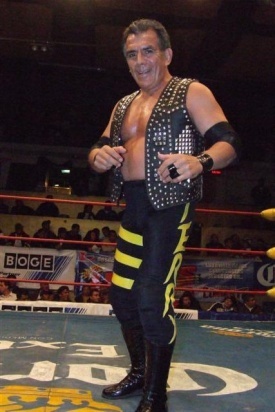 He's also still active in ring as part of Los Terribles Cerebros, a trio of long time IWRG regulars who will fight against both tecnicos and rudos. Terry is still one of the best technical wrestlers in Mexico and is equally capable of brawling like a rudo. Recently a new wrestler named Guerrero Maya Jr. appeared in CMLL and, announced as the son of the original Guerrero Maya. Black Terry never lost his mask as Guerrero Maya, so that connection is not widely known. CMLL explained Guerrero Maya Sr. had retired to Guadalajara. Guerrero Maya Jr. was quickly identified as former IWRG wrestler Multifacetico, revealing the family connection between two luchadors who often feuded when they were both in IWRG.